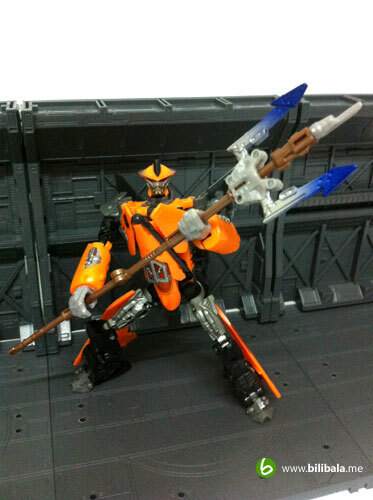 Seen a Transformers using a Trident as his main weapon? Well, there’s only 1 in my entire Transformers collection so far and, no, his name is not Poisedon, but with the name of Terradive. 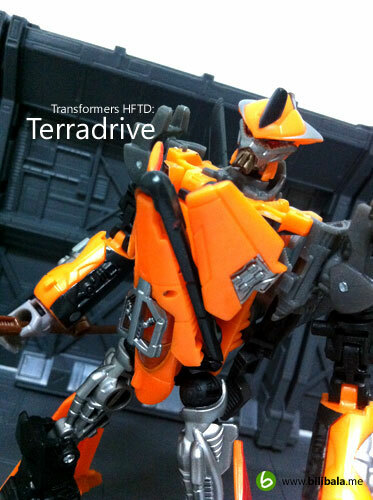 The name does sounds like Terrabyte Hard Drive to me. 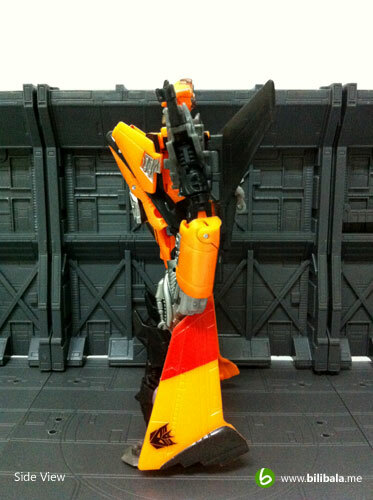 Anyhow, kinda cool to name an orange Trident holder Transformer. Upon searching the web, Terradive is one of the five Air Team robots who make up the legendary super robot Superion Maximus which of course this deluxe class i am having here can’t combine itself to form that super big robot. If you really like to know more about his background, you can click here for more info. 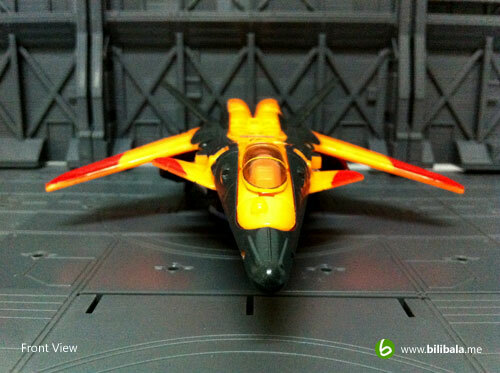 The alternate mode of the Terradive is actually a close resemblance of a Russian experimental Sukhoi Su-47 plane. Not quite a common fighter plane you might see everyday and that is what make it quite unique. 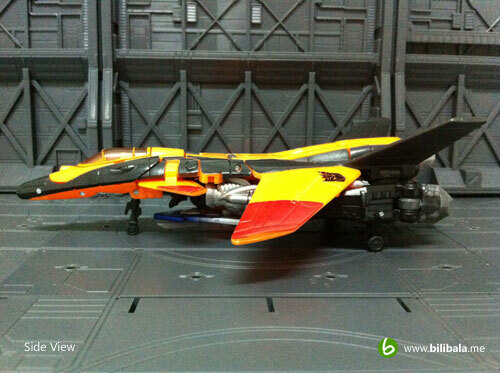 In additional, the orange color here does make the overall alternate mode eye catching and fresh! 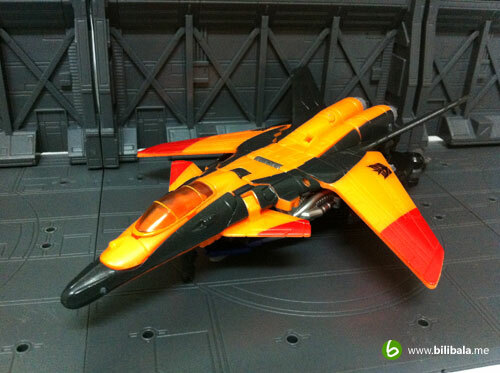 The overall plastic being used is those glossy smooth type which is quite similar to the Wreck-Gar or Scourge i have. The front of the plane is without the needle-like tip as seen in the original Sukhoi Su-47 plane. The cockpit window is in orange color as well and unfortunately, it can’t be opened. From the side of the plane, you can see some of the metallic parts. The trident is being pegged in at the bottom of the plane. You will notice that there’s a “C” peg holding the trident (the golden brown color) here. 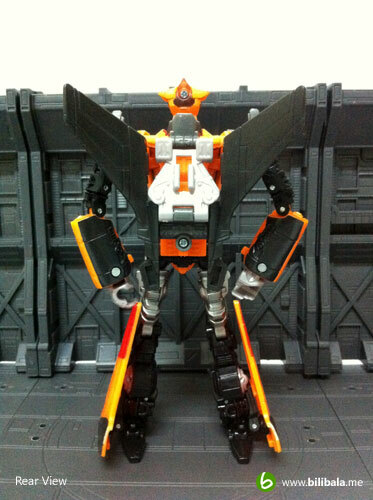 From the side profile, the wings for the lower legs does seem like a skirt for him. 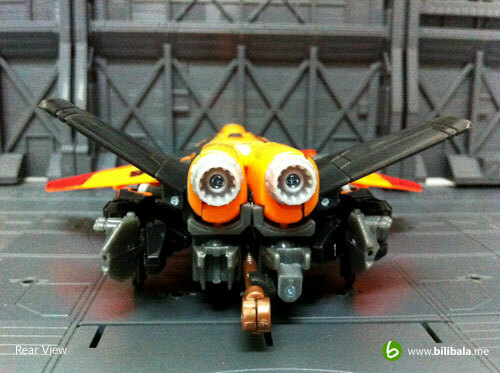 There’s the light piping here which is quite small and doesn’t really light up the eyes for the Terradive. Upon a closer examination, you will actually notice that the head piece is being painted with metallic silver. 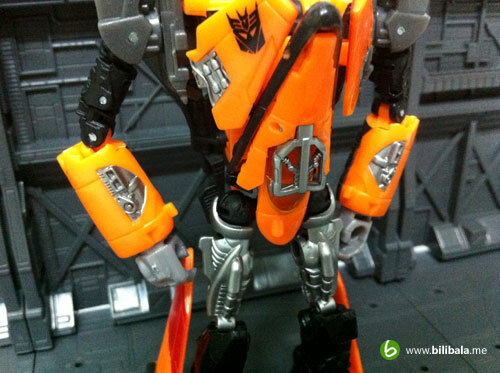 There are some other parts of him being colored in silver metallic which does add to the detailing of the robot. See more metallic silver colorings here. A sample pose for Terradive. Let’s go zap some Autobots! The transformation is quite intermediate. The twist and turn is quite direct and easily manageable. To be frank, i like this robot. 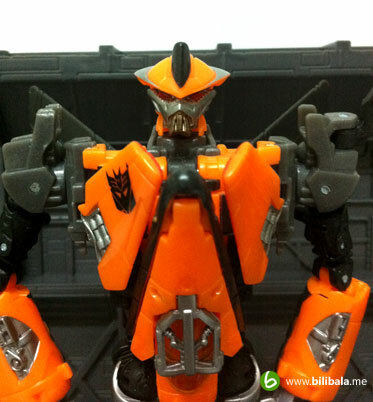 There’s really a LOT of cool features which deepened my affection towards collecting him. 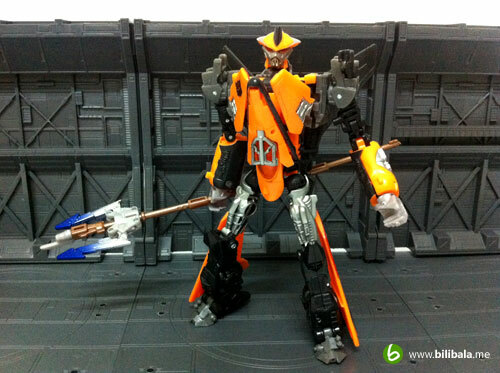 First off, he has a cool striking orange color and a cool blue gradient for the trident. 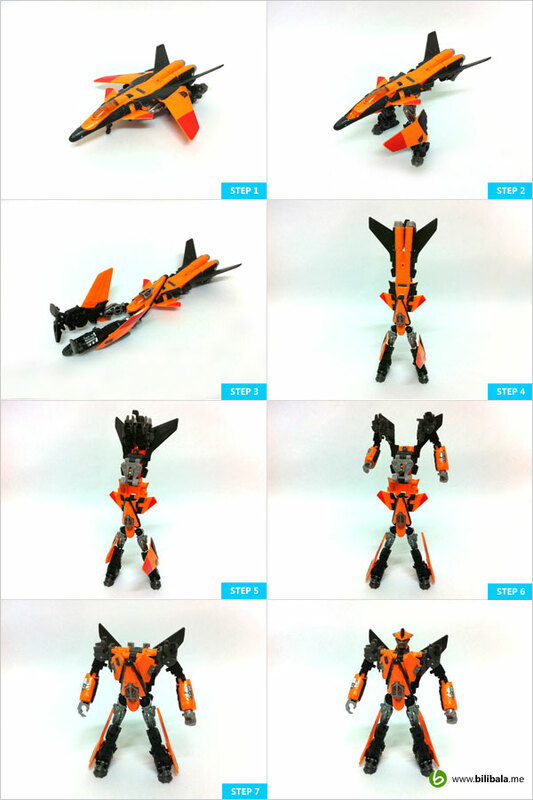 Secondly, he has an unique weapon which all my Transformers don’t have it. 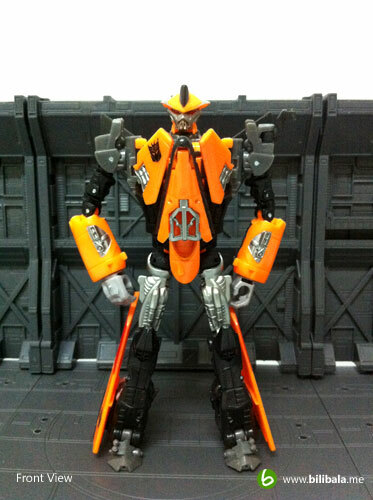 Moreover, his robot and alternate mode are awesome. And lastly and the most important point which also the bliss point for those people who like to pose with their robots, his articulation is so far the best i have and with the weight distribution nicely done, you can really do a lot of fancy pose with him. Is overall a great collection and i would give this piece a 10/10 for my PCR (Personal Collection Ratings). If you are interested in getting one, better hurry to grab one as it is selling like a hot cake now and getting lesser in stock nowadays. Enjoy hunting!